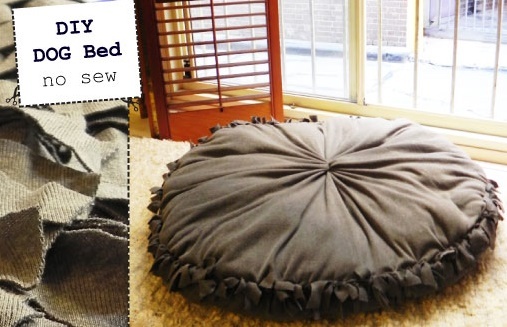 Yes, you read that right… a DIY dog bed anybody can make! Looking for a fun project to do if rainy days and Sundays always get you down? Made a dog bed this weekend and Luigi loved it. Took me about an hour with a glass of wine. You? probably a little quicker. 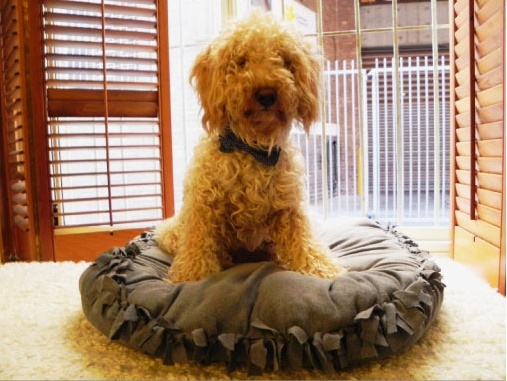 So here we go, an easy to make DIY dog bed… yes with no sewing involved! 2) 2 squares of t-shirt or polar fleece fabric ( depending on how big you want your dog bed to be, I used 1 m x 1 m square of fabric). 6) Dressmaking pencil to trace the fabric. 1) Fold both squares of fabric in 4. Pin the fabric so that it stays in place. 3) Cut the fabric using the guideline you just traced. 4) Take the other folded piece of fabric and place the piece of fabric you just cut exactly on top. Trace the bottom square of fabric in a rounded circle and cut. 5) Unfold both squares of fabric. Once flat, place both equally cut circles on top of one another and pin the fabric together. 6) Cut fringes all around the circles (cutting both pieces at the same time) – try to make them all equal … but no drama if they aren’t. Fringes should be approximately 2 cm by 6cm. 7) Unpin the fabric. Take one of the circles – fold it in four to find the middle of the circle. Take your elastic and wrap it around at about 7cm of the centre. 8) Place that circle ( elastic facing up) and put the other circle on top. Start tying both circles together by knotting the fringes together. Leave approximately 10 undone and start stuffing the bed. Here you can use the pillow stuffing and or old clothing you no longer wear. I will be making my girl one soon!! I’m having trouble understanding the process could you please add some more pictures of how it’s done? You are a legend!! I LOVE the simplicity of this project. I LOVE the fact that I can choose whatever fabric I want- including different textures for top and bottom. I LOVE the fact that it is so easy to wash – especially if puppy had a flea problem (or ‘accident’) – andyou can even wash the ‘filling’! I LOVE the fact that it’s so cost effective AND I can make it as big and as thick as I want! (My Bernese Mountain Dog will finally have a bed big enough for her giant fluffiness! Thank you!!!! I’ve been looking for a giant washable bed for my giant mountain dog too! I needed one that wouldn’t clash with it’s surroundings! Old fleece blankets that are worn would be great to use if you didn’t want to go buy new fabric. You can probably use a rubber band. it is used to make the center of the circle look like it is gathered. Re: tasseled pet pillow. Q) I’m a little confused too, Kourtney! I’m sure I’m missing something, but really excited to make these for Christmas gifts. Please help me understand why the center is wrapped with elastic and why it is left on the outside of the pillow. If there is a video of this, please post info for same. Thank you in advance. Thank you soooo much! I just finished my pups bed and he absolutely loved it! I did mine with a scottish plaid print on the fabric….a bit cheesy since my pup is a Scottish terrier! Nevertheless, I’m thrilled because he loved it! Thanks again! your weblog. Do you ever run into any web browser compatibility problems? I want to make this!! Such a great design and seems so easy. BUT, I don’t get the instructions or the purpose for the elastic. Please explain again. Thanks!! What’s up, this weekend is fastidious for me, because this occasion i am reading this enormous informative post here at my home. i got here to return the desire?.I am attempting to find issues to improve my web site! Made this bed and my dog loves it! She hardly let me finish it before she claimed it! I found the stuffing from the fabric store too expensive so I just bought two cheap standard pillows; it’s a little lumpy because of the rectangle shape but my dog doesn’t care! So happy I found this! Thank you! Really cute I like the edge where it looks ruffled. won’t the elastic pop of the center fabric once the dog is fluffing it up or laying on it? My dogs like to fluff their beds and scratch at it to make in comfortable to them. I have two old dog beds that I am washing then I will just recover them. Waste not, want not!! Great Idea..can’t wait to get the material and start making..thank you so much.. I do not understand how the elastic stays in place…do you just tie it? Won’t it just come off after dogs roll around on it a bit? How much fabric is that in the US? by yards? This is a great little project. I will keep this for a rainy day project. Can you tell us moee about this? I’d love to find out mote details. I made 3 of these for Christmas gifts and were pretty easy to make. The elastic is just used to have the gathers in the middle. Guess you could leave it off. Fixing to make one for my own dog. One thing to remember to be sure and tie the correct opposite strand or you will wind up with one being left out! 31 Easy DIY Projects You Won’t Believe Are No-Sew | シ最愛遲到.! Легло за домашния любимец | CraftRoom.bg | Оставете работата на въображението Си! | CraftRoom.bg | Оставете работата на въображението Си! Our Gentle Giants » Which DIY dog bed is right for your giant dog?